Do politically expedient proposals for more testing prepare children for the challenges of the 21st century? What is the role of schools in a time when the mass media are children's most frequent teachers? In Tomorrow's Children, based on her groundbreaking book of the same name, Riane Eisler offers a practical blueprint for transforming how we educate our children -- and ourselves. Through Partnership Education we can break the cycle of global violence that imperils the world. This new video will help us move toward a more equitable, sustainable and hopeful future. For everyone who cares about young people: from politicians and school officials to teachers, parents and students themselves. Riane Eisler is an eminent social scientist, attorney, and social activist best known as author of the international bestseller The Chalice and The Blade: Our History, Our Future. Her book, The Real Wealth of Nations: Creating a Caring Economics -- hailed by Archbishop Desmond Tutu as "a template for the better world we have been so urgently seeking," -- proposes a new approach to economics that gives visibility and value to the most essential human work: the work of caring for people and nature. Riane holds degrees in sociology and law from UCLA. She taught pioneering classes on women and the law at UCLA and is a founding member of the General Evolution Research Group (GERG), a fellow of the World Academy of Art and Science and World Business Academy, and a commissioner of the World Commission on Global Consciousness and Spirituality, along with the Dalai Lama and other spiritual leaders. She is also co-founder of the Spiritual Alliance to Stop Intimate Violence. She is president of the Center for Partnership Studies, dedicated to research and education. "I hope the vision [Eisler] has put forward here can be realized. With her, I believe that human happiness, if not survival itself, depends on it." "...an important and powerful manifesto, a blueprint for how to take the first steps toward a saner and more humane educational system." 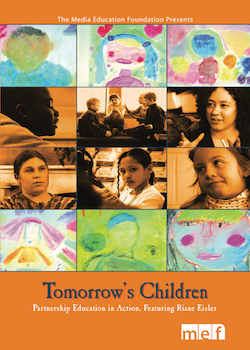 " ...a clarion call for and guide to an historic transformation... that will inform and delight teachers, parents, and all those active in building a better life for Tomorrow's Children." "... a practical approach to creating schools that teach partnership, respect, and global understanding." "...filled with knowledge, experience and love." "Eisler's plan to transform education is an education in itself... timely and needed for the whole-brain learning that each child deserves."